Foxborough teachers and administrators pose for a photo on the Gillette Stadium game field while touring the stadium during Foxborough’s New Teacher Orientation program on Aug. 20. Teachers make special stop at Patriot Place and Gillette Stadium as part of Foxborough’s New Teacher Orientation program on Aug. 20. 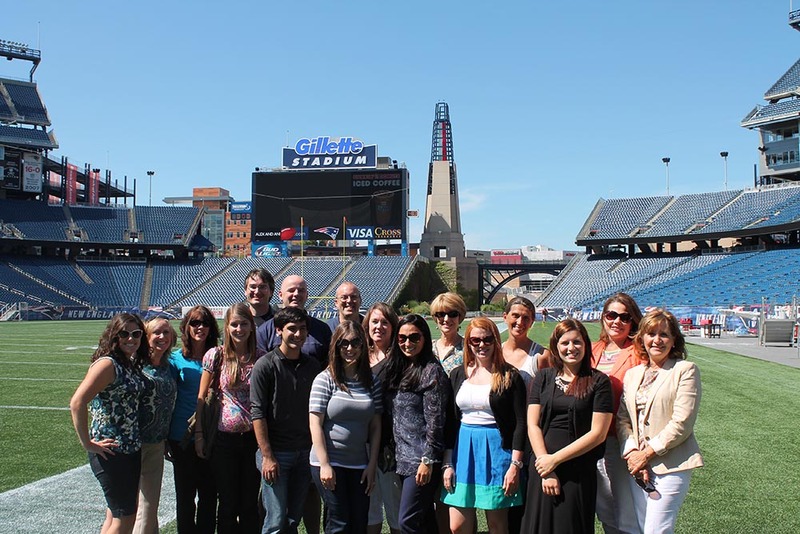 Before students emptied out of school buses and filled classrooms for the first day of school last week, 15 of Foxborough’s newest teachers became acclimated to their surroundings with a tour of the town on Wednesday, Aug. 20, which culminated with a special visit to Patriot Place and Gillette Stadium. Following a greeting by administrators and officials, the teachers participated in a two-hour workshop before boarding a Foxborough School bus for a tour around town. When the tour arrived at Gillette Stadium, the group filed out of the school bus much like their students did on Tuesday, Sept. 2, and gleefully marveled at the sight of the complex before settling into Patriot Place’s CBS Scene for lunch. Following lunch, the teachers and administrators enjoyed a special tour of Gillette Stadium provided by stadium staff. The teachers toured the locker rooms and game field, where they stopped for photos and learned how the lines are painted and erased for different sporting events before making their way to the press box. Spinelli said the best part of the stadium tour was giving the new teachers an opportunity to see what makes Foxborough special. “The tour, in so many ways, represents a warm and concrete welcome by the community of Foxborough and all it represents in the collective sense – residents, business partners and local establishments,” Spinelli said. Among this year’s group of new teachers are Foxborough residents Jennifer Greenleaf, Edward Lavallee, Meghan McGuire, Danielle Nalbach and Lucille Sullivan.